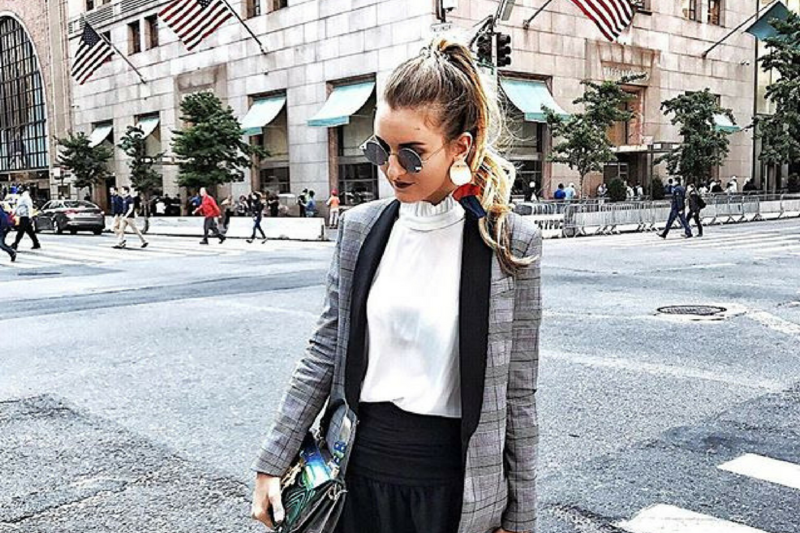 Natasa Blair is a hugely popular Serbian-born fashion blogger who has really developed a name for herself in the industry. 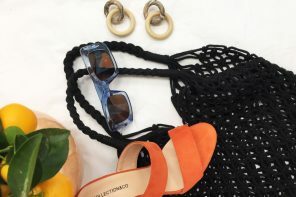 After moving to Milan, Natasa set up her fashion blog, showcasing gorgeous outfits in amazing locations! 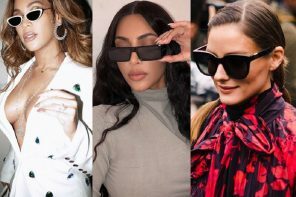 She has since developed a significant following on Instagram and is now a much-celebrated fashion icon. 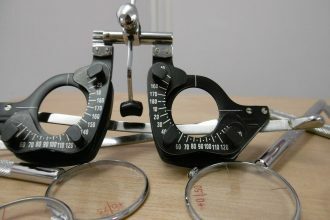 She also loves her eyewear and often wears a pair of sunnies or specs to finish off her look. 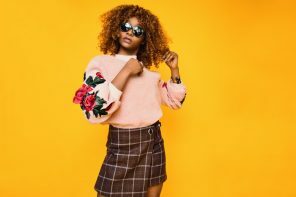 Below we have pulled together some of our favourite looks from this gorgeous lady, and how you can steal her style! Keep reading to find out. This striking outfit would be perfect for Autumn. The ruffle dress is so in fashion right now, and looks amazing teamed with the lacey red heeled boots. Natasa cinches in her waist with a chunky black waist belt, which gives her a gorgeous silhouette. The feather detailing on her bag is so unique and lends her outfit some extra interest and texture. She has gone for some dark grey cat-eye lenses, which add some extra glamour to her look. The dark grey compliments the red very well. You can get her look with the Prada PR 53SS. 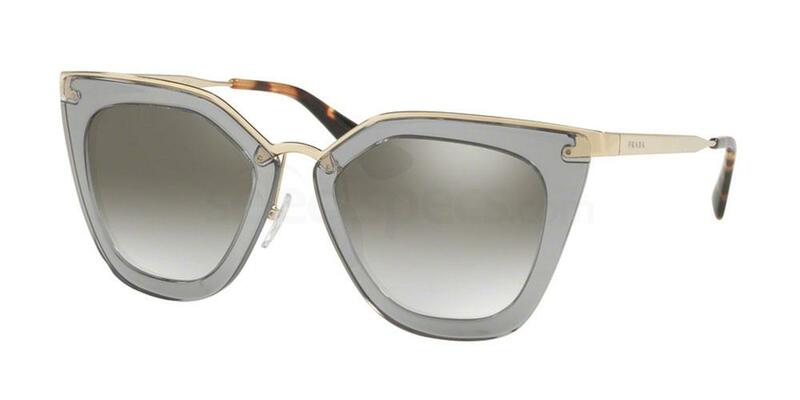 These amazing sunglasses feature a grey frame, cat-eye frame shape and gold detailing on the temples. The tortoiseshell on the temples is a nice extra detail. Silver mirror lenses finish off the look. Flat brow sunglasses are all the rage for 2017 and 2018, and we love how Natasa has styled her pair. Her sunglasses have a gorgeous tortoiseshell frame and pale tinted lenses. They look great teamed with her camel trench coat, tearaway trousers and her structured blazer. This is a super trendy yet smart look, which would look amazing worn to the office. Once again she adds her belt to cinch in her waist and to prevent the outfit swamping her. Get the look with the Celine CL 41026/S. 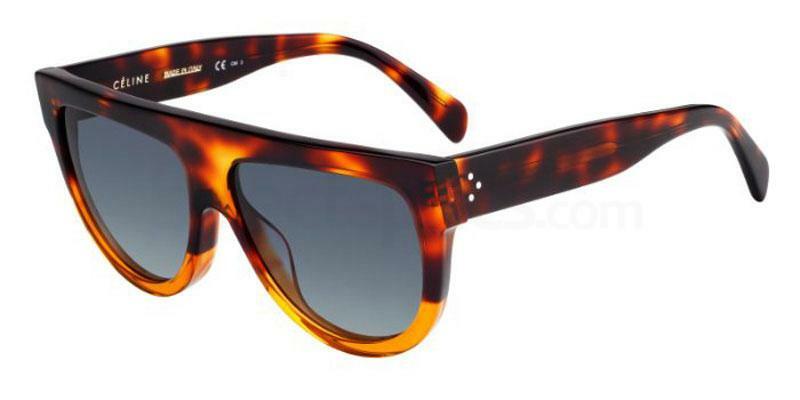 These sunnies have a tortoiseshell frame and a flat brow design, almost identical to Natasa’s! Add some retro glamour to your look with some round frames as Natasa has done here. Natasa wears some black round sunglasses which although very simple really elevate her outfit to something super trendy and fashion-forward. They look fabulous with her grey plaid jacket, white blouse and cute black shorts. Get her style with the Ray-Ban RB3592. 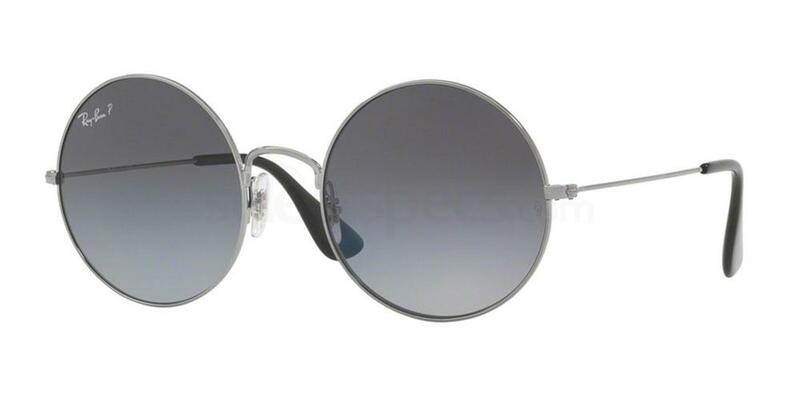 They have a round silver frame with dark grey tinted lenses – the perfect go-to pair for everyday! Natasa looks beautiful here, teaming some stunning white retro cat-eye sunglasses with a pretty gingham ruffle dress. This look is so feminine, with the bardot neckline, flowing fabric and flower accessories in her hair! 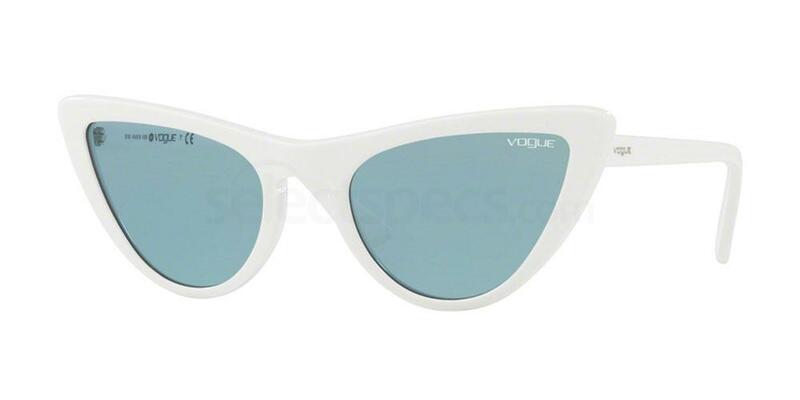 Get her sunglasses look with the Vogue VO5211S. These amazing sunglasses have a bold white frame, sleek cat-eye shape and pale blue tinted frames. These would also look amazing worn with a pair of jeans and a white tee for a chic casual look. Have a look here to discover Prada’s AW ’17 collection. Tag #SelectSpecsSelfiefor a chance to be featured on our page!